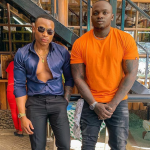 Japo Kidogo, a song that was released by Otile Brown and Khaligraph Jones roughly three days ago is no longer on YouTube. It seems to have been deleted. We noticed that it was not available on the video sharing platform yesterday evening. Maybe it was brought down much earlier. Anyway, I would not sweat it, this seems to be an orchestrated move since Otile Brown brown have also unfollowed each other on social media. The video had been uploaded on Otile Brown’s page on March 25 around 5pm. The last time I checked, it was almost clocking 300,000 views and was trending at number one. Simply put, the song was doing well by Kenyan standards. Maybe they expected it have more numbers in the first few days, when it didn’t, they decided to make it private (hide) it on YouTube so that when the song is back it’s even bigger. King Kaka pulled a similar stunt with Dundaing when he released it. The post Khaligraph’s collabo with Otile Brown dubbed ‘Japo Kidogo’ has been deleted from YouTube appeared first on Ghafla! Kenya.